We have designed the Care 2848S with your safety in mind. Most household accidents occur in the bathroom due to wet surfaces; we have manufactured this walk-in tub to eliminate injuries that might occur as a result of slips and falls. Compact yet spacious, this model is a slightly larger version of the Care series. It offers more room to relax and enjoy the benefits of this walk-in tub. With a water-tight, S-shaped door that is ergonomically designed to allow for ease of entry at the hip area, this walk-in tub allows for a smooth transition into and out of the bath. 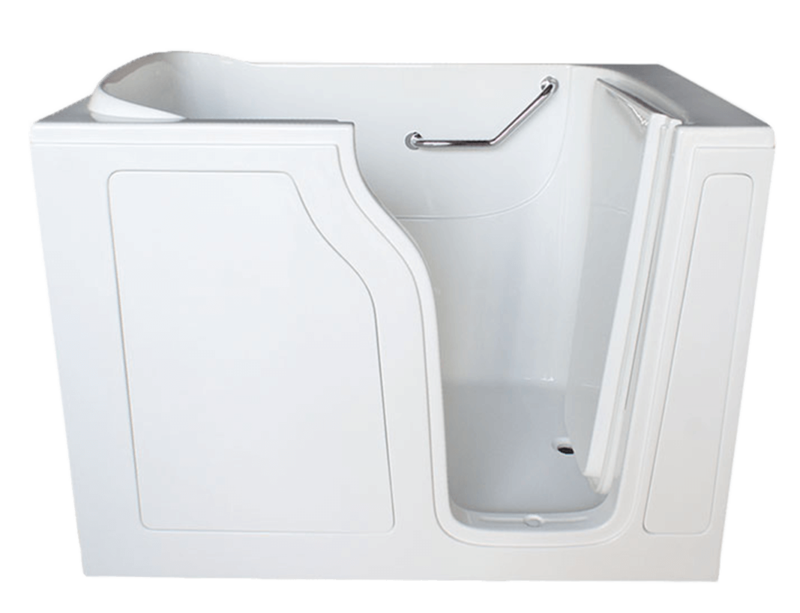 In addition, this model is designed with a low-threshold 6″ entryway and 6 adjustable levelling tub feet, which allow users with mobility concerns to safely use this walk-in tub without worry. 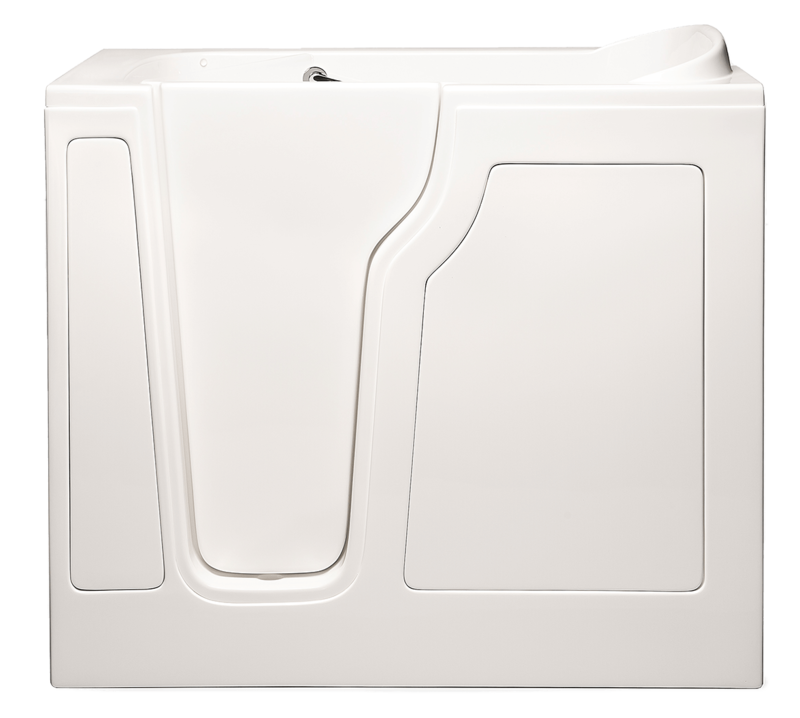 To aide in sitting and standing while you bathe, the CARE 2848S comes with a fully integrated, interior safety grab bar and an additional U-bar for peace of mind. Fitted with an ADA compliant contoured seat measuring 20.5″(W) x 17″(H) x 14″ deep and a textured, non-slip floor for added security, this tub will make any bather feel comfortable and relaxed. Your comfort is important to us. The CARE 2848S measures at 21(W) x 48(L) x 45(H), 40” deep so there is ample room to adjust your position in a water level that is just right for you. Designed to replace your existing bath tub or shower stall, this walk-in tub comes with an extension kit of matching fiberglass and gel coat to perfectly fill a standard 60″ opening. We understand that replacing your existing bath or shower is a significant project; therefore, we design our walk-in tubs with a flangeless design in order to preserve your existing tile work and cut the cost and duration of your installation. We offer an optional tile flange kit which is available for remodeling or new construction. We aim to make your installation process as seamless as possible so that you can enjoy the comfort of your walk-in tub as quickly and straightforwardly as possible. It is our goal to provide the highest quality walk-in tub on the market. The CARE 2848S is constructed with a one piece, stainless steel frame made of the highest quality, gel coated fiberglass which offers the perfect colored finish in either white or biscuit. The Care 2848S is engineered to lock in the water capacity needed and avoid spillage with a removable access panel for any maintenance needs. In addition, all electrical components in your walk-in tub are certified by the Underwriters Laboratory (UL), which means that when you purchase one of our walk-in tubs, you can be certain that your tub meets the highest standards in the market for safety and durability. Your CARE 2848S comes with several useful and appealing fittings to make your bathing experience soothing and enjoyable. Besides being beautifully crafted, the chrome plated faucet set with solid brass construction is designed with hot and cold water taps and a convenient diverter handle to adjust water temperature. An optional hand held shower hand piece is also available so that you can enjoy both a bath and/or a shower. Each of our walk-in tubs comes with a standard 1.5″ drain. You may wish to opt for our 2″ Hurry Drain and secondary toe drain. This feature allows your tub to drain in 110 seconds or less depending on the efficiency of your household plumbing. We want you to have an amazing experience every time you use our walk-in tubs. Read below to see how you can customize your walk-in tub with additional features that allow you to increase your health and well-being while offering you a spa-like experience in your own home.